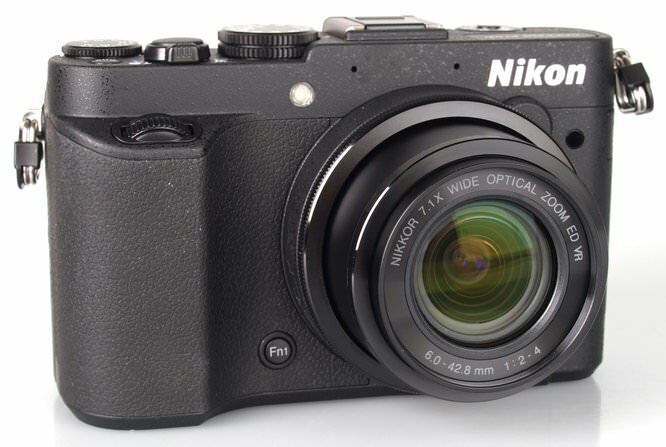 The Nikon Coolpix P7700 features a new bright f/2.0 7.1x optical zoom lens, swivelling screen, manual controls and full HD video recording. The Nikon Coolpix P7700 is this years update to the Nikon Coolpix P7100, gone is the optical viewfinder, but instead Nikon say this new model is smaller (slightly) than the P7100, but with a much larger, brighter lens, as this camera has an f/2.0 - f/4.0 7.1x optical zoom lens, compared to the previous f/2.8 - f/5.6 lens. 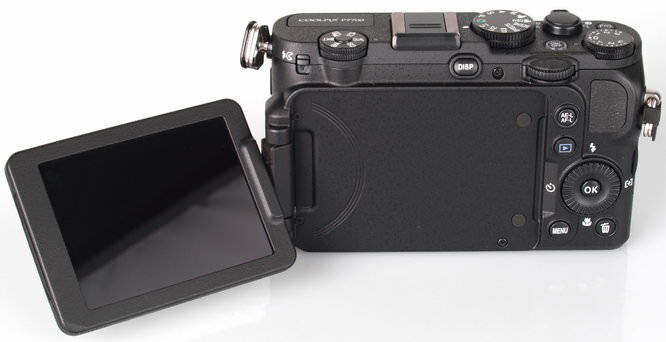 The camera also features a swivelling screen on the back instead of the tilting screen of the P7100. Instead of the 10 megapixel CCD sensor in the P7100, the P7700 features a new 12 megapixel backlit CMOS sensor, this improves shooting speed, with 8fps continuous shooting, as well as adding Full HD video. Other improvements made to the P7700 include a new tilting screen, and the bright f/2.0 to f/4.0 7.1x optical zoom lens equivalent to 28-200mm in 35mm terms. The lens on the Nikon Coolpix P7x00 series has the most optical zoom out of all other serious compact cameras (see our table below), and it's now nearly as bright as the others with f/2.0 at the wide end, and f/4.0 at the telephoto end. 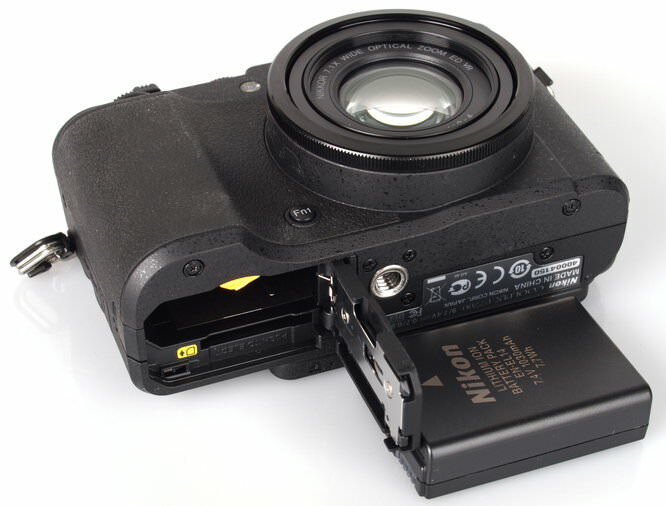 Handling - The Nikon Coolpix P7700 has an extremely solid metal body with a large rubber hand grip at the front. There is a small thumb grip at the back. The camera features a new swivelling and tilting screen with a high resolution of 921k dots. It also looks better than the previous model with a more modern look and styling, although some will find the removal of the optical viewfinder disappointing. On the side is a microphone socket, as well as a GPS socket that accepts the Nikon GP-1 adapter. 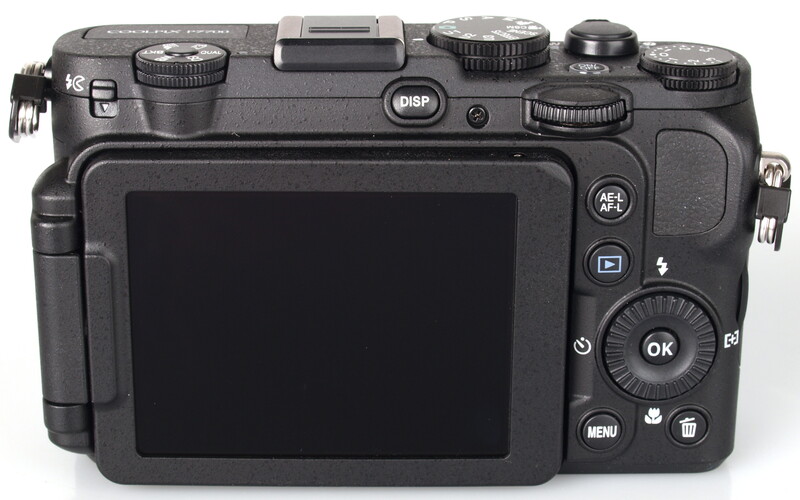 An exposure compensation dial is found on the top right, as well as a quick menu dial on the left. A front and rear command dial is used for setting aperture and shutter speed in manual mode or can be used in conjunction with the Fn1 and Fn2 buttons. There is a filter thread surrounding the lens, and the ring can be removed from the camera to add other adapters. Menus – The menus are split into the usual Photo / Playback and Setup - they are clear and easy to read. Another set of menus are accessible through the Quick Menu Dial where you can set Quality, ISO, WB, Bracketing, My Menu and Colour. Colour options are: Standard, neutral, vivid and black and white with each of these customised so you can set sharpness, contrast and saturation. The black and white option lets you set a colour cast, such as sepia and cyanotype (blue), as well as set a filter effect (yellow, orange, red, green). The function buttons can be customised and you can set function 1 to MF, Metering, Continuous, Flash exp. compensation, Active D-Lighting and Manual flash level (when used in combination with a command dial) and function 2 to Virtual horizon, view/hide histograms, view/hide framing grid and built in ND filter. Battery life - Battery life is rated at 330 shots according to Nikon / CIPA test results, we took over this amount during testing and the battery was still showing as full. The Nikon Coolpix P7700 has quick shutter response, and reasonably quick focus at the wide end of the lens, but this slows quite noticeably at the telephoto end. Switch on time is quite good, and shot to shot is reasonable, although not as quick as some others. The camera can shoot at 8fps for 6 shots as JPEG or RAW images. 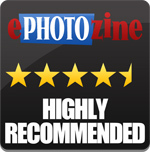 Sample Photos - The camera produces images with excellent colour and very good exposure. The portrait shot shows no signs of red-eye. With a bright-ish f/4.0 aperture at the telephoto end it's possible to create a slightly shallower depth of field than normal, and the photo of the water gargoyle shows a nice slightly softer background. Lens Performance - Detail and resolution is good, even into the corners of the image. Purple fringing is a little higher than expected. Dynamic range can be expanded by using the D-lighting option or alternatively the backlighting mode. Macro performance is good, with the subject just 2 cm away from the front of the lens, however the macro performance isn't very good when zoomed in as the subject has to be much further away from the lens. ISO Noise Performance - Noise is minimal at ISO80, 100, 200 and 400. At ISO800 noise creeps in. Noise increases at ISO1600 with detail being reduced. At ISO3200 noise reduction smudges detail further. Noise is at it's strongest at ISO6400 and this setting could be best avoided. White Balance Performance - AWB (Auto White Balance) performs well under tungsten lighting with slightly warm results. Using the tungsten preset gives very similar results. There's also an auto (warm) white balance mode to keep more warmth in the image if required. The AWB performs extremely well under fluorescent lighting, with the fluorescent preset giving a magenta cast. There are three different fluorescent presets if you're not happy with the AWB results, although for the most part leaving it on auto should be fine. Panorama mode - There is a 180 degree panoramic mode, or a 360 degree mode, where you simply pan the camera around and it will automatically stitch the image as you pan. The camera also features panoramic assist, this lets you take full resolution photos and shows an overlay of part of the last shot to assist lining the photos up - this could be particularly useful if you wish to create high resolution panoramic photos, as the resolution of the automatic panoramics isn't particularly high. Digital Filters - There are a large number of effects available including some not regularly found on other cameras, including zoom exposure and defocus during exposure. However, zoom exposure and defocus during exposure don't work if RAW is on, and there is no warning that it doesn't work, as it will still let you take the photo, and appear as if something is happening (hopefully this will be fixed with a firmware update). 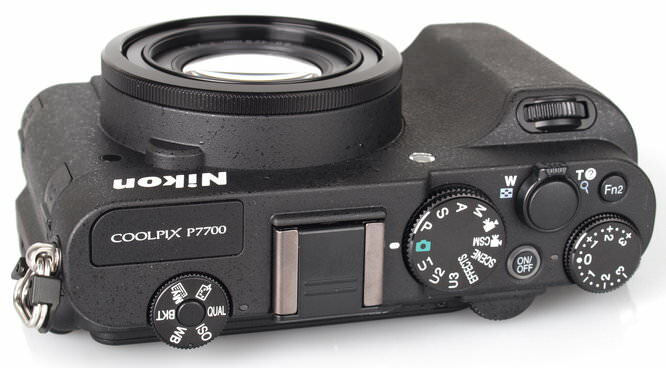 Video - The Nikon Coolpix P7700 has updated video options, including manual controls, AF mode: single or full-time, wind noise reduction (off in this video), aperture, ND-filter. It's also possible to apply special effects to video: painting, cross process, soft, nostalgic sepia, high key, low key, or selective colour. Zoom speed can be set to Auto, Normal or Quiet. 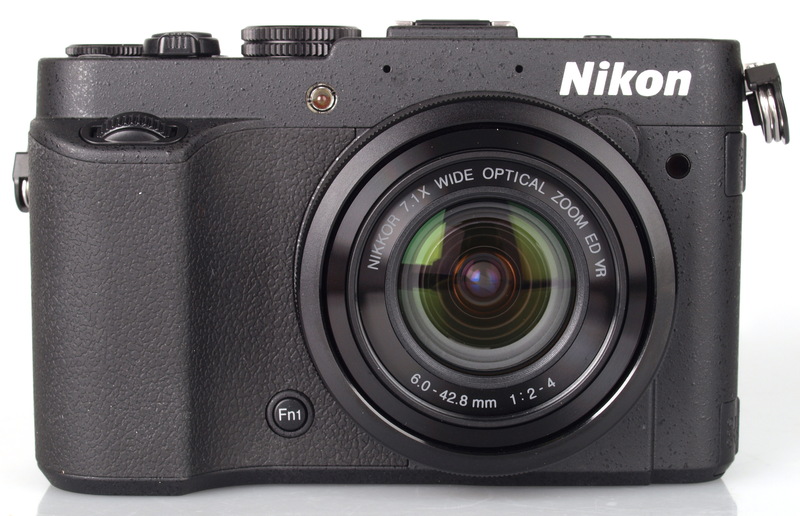 The Nikon Coolpix P7700 offers the most optical zoom in a "serious compact" camera, and the new lens is brighter than the old lens at both the wide and telephoto end of the lens. This in combination with optical image stabilisation and a 12 megapixel backlit CMOS sensor gives this camera much better low light performance than the previous model. Other updates include quicker continuous shooting, automatic panoramic stitching and full HD video recording. The Nikon Coolpix P7700 is certainly a good camera, a great camera in fact. But for not much more money you can get the Sony Cyber-shot RX100, with a large 1 inch sensor. Although if you want more zoom in your compact camera and still want the lens to be bright, then the Nikon Coolpix P7700 certainly ticks all the boxes. Particularly if you want to be able to use the P7700 as a more serious compact camera, with RAW shooting, flash hot shoe, and tilting swivelling screen the P7700 is about as serious as they get. Image quality is very good and images have great detail, however it is at the higher end of the price range. 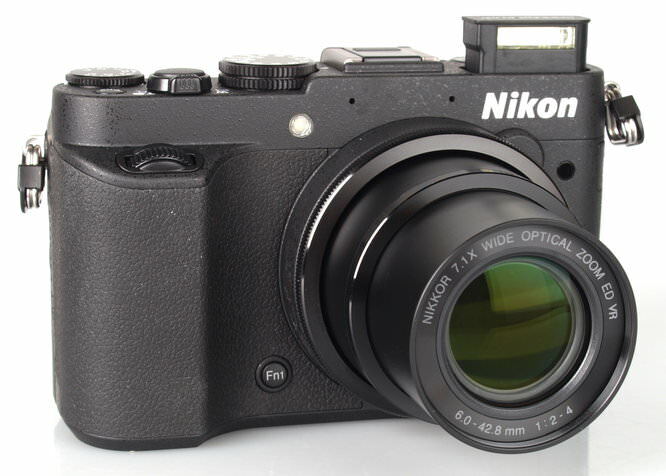 The Nikon Coolpix P7700 has a unique and bright f/2.0 7.1x optical zoom lens that delivers great images. I agree, purple fringing is way too high for this class of camera. Pity you don't seem to be able to mount an EVF on the hotshoe, but the geek lady gets my vote too. So Nikon can make great cameras! (sometimes...) and yes the geek lady is cute but we might get in trouble if we continue....I'll be nice from now on!